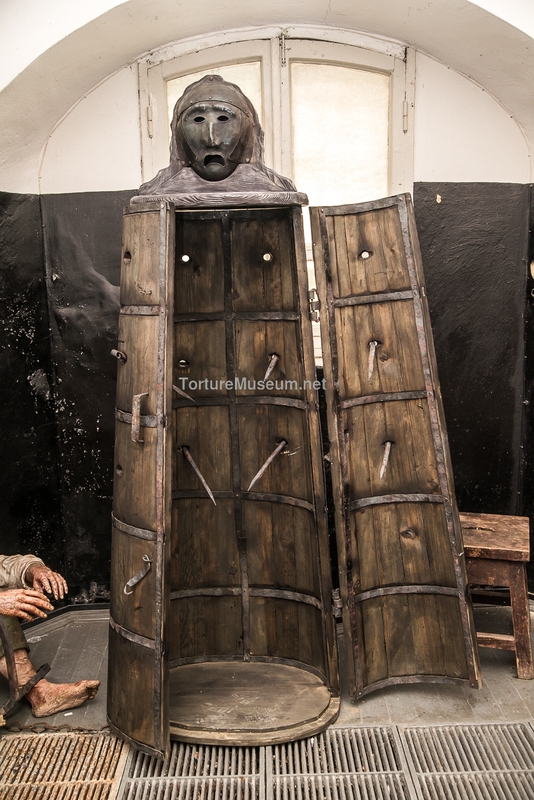 The “Nuremberg Virgin”, also known as the “Iron Maiden”, is considered one of the most excruciating devices made for torture. The “Maiden’s” appearance is often linked to the Middle Ages, though there is reason to believe that, in fact, it was not conceived until the end of the XVIII century. The Nuremberg title is due to the fact that the most famous variant of the “Maiden” was constructed there. Initially, there was a model created with holes instead of spikes through which long nails were push through one by one, but the device was later modified. 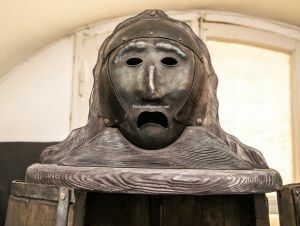 The classic “Iron Maiden” design consists of a sarcophagus, feminine in appearance, 7 feet high, with a Virgin Mary placed on top by the inquisitors — a symbol of the triumph of Christianity over heresy and dissidence. A person placed inside suffers from both claustrophobia and the horrible pain of punctures from spikes sometimes over 20cm long. The positioning of these spikes has undergone the careful scrutiny of torturers so that vital organs are not hit. This elongates the offender’s torment considerably. The points stab the arms, legs, stomach, eyes, shoulders and buttocks, all at once. Repeated opening and closing of the doors inflicts deep, bleeding wounds, and the darkness, as well as the fear of the unknown, make the torture psychologically unbearable. In the end, the murderous offender sinks to the bottom of the chamber, his dead body subsequently thrown into a river. An interesting fact: Such a method of execution with an iron grip was invented much earlier by the Spartan king Nabis. He had the iron chamber built in his wife Apegi’s appearance, his wife having come to his aid when his silver tongue was not enough to convince subordinates to repay their debts. The arms and chest of the femme fatale were covered in thin needles, and in her company, debtors truly underwent a harrowing experience. Here is the very ‘Iron Maiden’ that we’ve all heard so many rumors about. The device is similar to ancient Egyptian sarcophaguses, as you’ve probably noticed, with the one difference here being that a live subject is often placed inside. 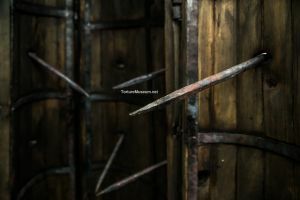 The little doors open, demonstrating the internal walls, “Virgins”, which have been dotted with long, iron spikes. The one convicted is forced inside. He can fully stand — there is enough room for that. All that remains now is to close the doors. You say that the spikes will puncture him and kill him quickly? Experienced inquisitors have already considered this, and the spikes are done in a way that the victim’s vital organs won’t be hit. A piercing cry melds with the thick knock of the padlock hinges. The man suffers unimaginable pain. Ten stab wounds, all caused at the same time. Two in the shoulders, two in the lower back, three in the chest, one in each buttock, and another one in the stomach. The spikes bind with the wounds, and from said wounds blood slowly starts to flow. The inclosed space and darkness merely exacerbate the misery. The heretic can’t fall, and any rash movement only deepens the punctures. Sometimes the executioners will open and close the sash a few times. Generally, the body of the one executed falls to the bottom of the chamber after the third or fourth time. Incidentally, have you noticed that the barrel chamber has been crowned with a sculpted head of the Virgin Mary? When the heretic or pagan enters this dark womb, it is there to symbolize the holiness that administers him unto the Catholic faith, and absolves him of all his sins. They say that bodily suffering purifies the soul. © 2015 Torture Museum. All rights reserved.